With Owasso Public Schools’ calendar officially beginning this week, it’s time to re-negotiate your morning and evening routine to include dropping off and picking up the kids after a summer of direct commutes to and from work. 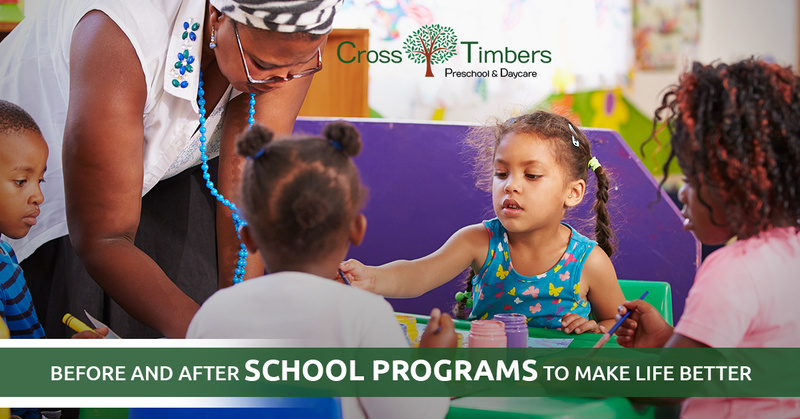 Don’t worry- Cross Timbers School’s before and after school care program has you covered. There’s nothing worse than worrying all night about all the things that can go wrong when you don’t have a way to get your child to school on time without leaving work or leaving them to get to school on their own. We get it. That’s why we are dedicated to providing high quality before and after school care for your elementary age children. At Cross Timbers School, we provide a safe, supervised space for your child in the morning before they head off for a day of learning. In the afternoon, we make sure to provide the same environment with opportunities to play, grow, and work on things learned during the day at school, allowing you to stay focused on having a productive workday and a safe drive to pick up your happy child. Days off school are rarely days off work, and these dates, sprinkled throughout the year, can be a source of frustration and worry for parents trying to arrange last minute care for their children. When you enroll in our before and after school care program, you can leave those worries behind you. We provide care on days when local area schools are closed, making sure you can take care of your work life and providing peace of mind in knowing that your child is with a familiar, friendly group of their peers and our professionals. Schedule a free walkthrough today to learn more about Cross Timbers School and how we can help improve your work day and your child’s school day.